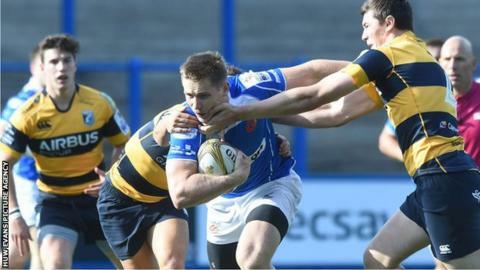 Newport Gwent Dragons wing Matthew Pewtner has been forced to retire from injury on medical advice. A statement issued by the region said the player had failed to recover from a head injury he suffered during the Premiership Sevens in August 2015. The 25-year-old started his career with Blackwood and played sevens for Wales. "I am devastated that I have been forced to retire from rugby through injury, but I know that it is the right decision," said Pewtner. In May 2015, another Dragons player Ashley Smith had to retire at the age of 28 following a "series of concussive events". And in September former Wales back-row Jonathan Thomas retired after being diagnosed with epilepsy linked to head traumas suffered while playing. Dragons director of rugby Lyn Jones added: "It saddens us all to hear that Matthew has been forced to retire. "We are all grateful for Matthew's fantastic contribution to the team throughout the years he has been with the region. We wish him all the best for the future." In addition to playing seven for Wales, Pewtner was capped at under-20 level in 2009-10. He said he would be studying for a teaching qualification.